Hope to see you there! The show will run from 9:00am - 6:00pm on both days. The two images above, "Icon," and "One With," are a crosshatch etching, and a full-value lithograph (respectively). Both illicit the range of emotions that arise when we delve into the issues of animal rights and humane treatment of chimpanzees. The subjects are shown in their natural environments. The creation of these two art pieces was a rewarding experience for Mr. DeVito, allowing him to connect to the same core beliefs as Jane Goodall and her lifelong fight to save the chimpanzee. Research now shows that humans and chimpanzees share a similar brain pattern when communicating. Can you see the comparisons here between us and our closest relative in the animal world? Yesterday, Wednesday April 13th, 2016, was the Ducks Unlimited Boston Benefit Dinner. With record attendance, the benefit made enough money to save around 2,000 acres of wetlands. 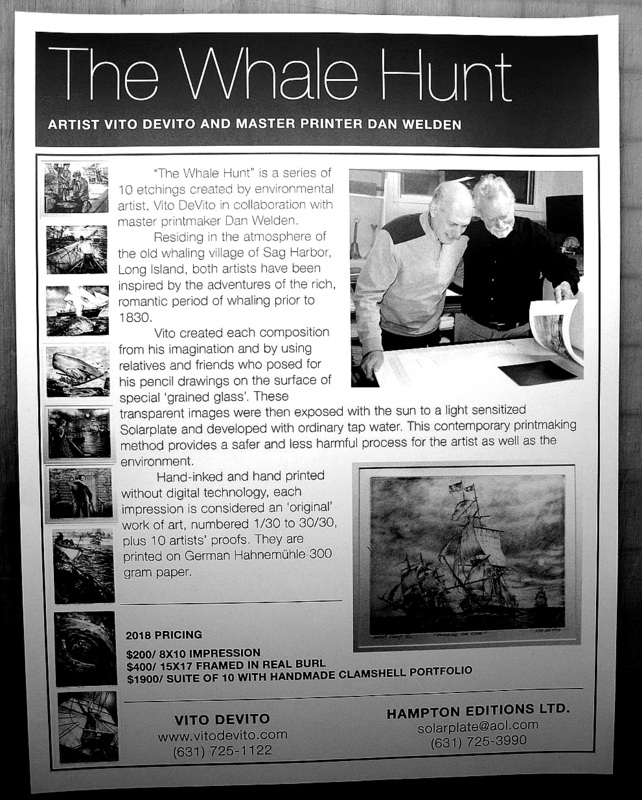 Mr. DeVito exhibited and sold his work, while attendees enjoyed a silent and live auction and an exclusive dinner. The Boston Chapter of Ducks Unlimited has been working to create a Sponsorship Program for Massachusetts, which calls on an artist to paint a hunting scene that will promote membership through the use of the reproduced image. This program has been successfully employed on Long Island through Mr. DeVito's last fourteen Ducks Unlimited paintings. The event details are up on my website now click the Events page to view. This event was held at the Fairmont Copley Plaza Hotel. For the Event's official web page, click on www.bostondudinner.org. "Eel Through the Ice - Circa 1950" 7 x 11 $250 Unframed. The Buttonow brothers, pictured here, helped build part of John Steinbeck's house (located on the right side of the etching) where he wrote the famous novel "Of Mice and Men." Eel fishermen used to earn a living by catching eel through the ice and then selling them to New York restaurants. BUST IN 'LOST CAST' TECHNIQUE, AND HAPPY EASTER! On Easter Sunday I always think of my Mom. This Bust of her, which I executed in High School, was my first of many through the years. It was sculpted in oil-based clay then cast in plaster using the 'Lost Cast' Technique. Here's to you Mom. Thinking of you on this special day. Vito DeVito Studios is taking bronze bust (and other) commissions. Contact me here, by Facebook message, or through the Contact Page on www.vitodevito.com to request a commission. The original watercolor "Sag Harbor Seals II" (18 x 24) was commissioned by Betty Lawford Kennedy quite a few years ago. The painting is now in her daughter, Robin Lawford's home in Southampton. Robin has commissioned Mr. DeVito for two more pieces in the past year, and his print company has decided to reproduce the image in a limited/signed Giclee of 50 Artist Proofs. Now for sale at $200 (Unframed) on the Gallery and Store page of this website. Click here to view in the e-store. "This painting depicts a tandem pair of Wood Ducks committed over a mixed rig of Goose and Mallard decoys. Both Gunners are up and ready to start the day with four in the bag; and with an oncoming string of Canada geese just out of eyesight, another promising challenge awaits. This is Vito DeVito's fourteenth sponsor print for Ducks Unlimited and shows his strong commitment to the waterfowl resources and important habitats on Long Island." "Kellis Pond is one of many fresh water ponds across Southampton that are vital for waterfowl, fish, and other wildlife. Not only do these ponds provide roosting and feeding opportunities in the surrounding agricultural fields, these ponds provide critical fresh water for birds that feed in the salt water marshes and tidal areas. This 19-acre pond's depth runs as deep as 100-feet, and according to local legend, has no bottom in some parts. Due to its' immense depth and spring sources, this pond has never gone dry, making it a reliable irrigation source for local agriculture. The depth and springs also make this one of the last bodies of fresh water to freeze in winter (if at all), making it a hotspot for waterfowl in the winter. The pond's deep, clean water supports a great number of fish, reptiles, amphibians, and local wildlife. Kellis Pond supports local production of Wood Ducks and Mallards in the spring and attracts many different species during the fall migration." "Unanticipated Beginnings is copyrighted by Ducks Unlimited in a signed and numbered limited edition of 350 prints. These prints will be made available only to those individuals or corporations who become sponsor members of Ducks Unlimited during the 2015-2016 fund raising season at the minimum Bronze Sponsor contribution level of $250. Additionally there will be a limited series of 50 Silver Edition prints and 20 Gold Edition prints for giving at the Silver ($500) and Gold ($1,000) levels. Special personalized remarques and framing are available directly from the artist at additional charge, as well as Artist Proofs. This year's Long Island Sponsor Print Program has been generously underwritten by Mr. Donald Grodski and Family. Don is a Life Sponsor, active member, and past Area Chairman of the Eastern Suffolk Ducks Unlimited Chapter." The previous excerpt was gleaned from a Ducks Unlimited informational flyer. Please contact Mr. DeVito through this website for Artist Proofs or more information. This painting is also available for sale though the "Gallery & Store" page on this site (Hunting section). "First Chance" shows the natural beauty we see as Dawn's first light rises over an open waterway here in the Northeast. Two hunters prepare for their first chance to bag some Geese cupped and committed to land. It's dead calm, the decoys are mirrored on the glassy water and the hunters are given a memorable image that won't be forgotten. There are 12 Artist Proofs. The etching is 11X14 in size, and $300. Archivally framed in real Burl for $400. Come see me at this well-attended local show! Also, a big thanks to all who attended the 77th Annual New York City Ducks Unlimited Dinner and Sportman's Exhibition, held at the Tennis & Raquet Club in Midtown--it was a huge success with over 240 attendees and over $170,000 raised for wetland conservation! I am proud to be the the only artist invited. "Ice Boating on Mecox Bay - Circa 1940"
Major Etching. 25 x 35 (framed). 12 Artist Proofs. $1,000. One of a continuing suite of Etchings depicting the varied, rich lives and livelihoods here on the East End of Long Island, New York. This new Vito DeVito Artwork Etching is 16 x 20 framed, with 12 Artist Proofs. The dawn scene depicts goose hunting out here on the East End of Long Island, New York. $450. A new commission for Vito DeVito Artwork "Homes of the Hamptons"
A recent commission to paint John Zuccotti's three homes in East Hampton. The artist has received many commissions to paint historic farms, homesteads and estates of importance out here on the East End.